No Bake Desserts that are Quick and Easy! 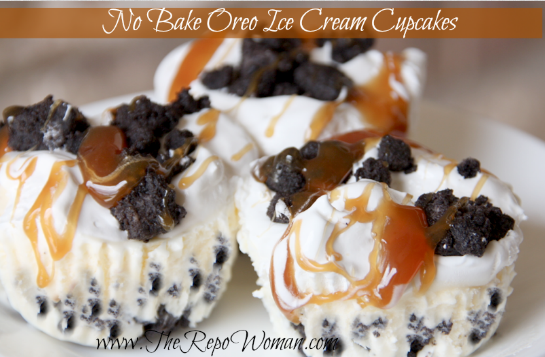 I am obsessed with all the no bake desserts I find on the internet! 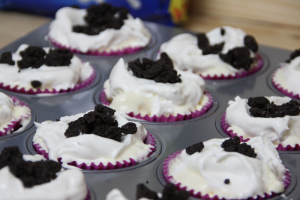 It started off with the no bake Ice Cream Cake obsession and now I am onto cupcakes! 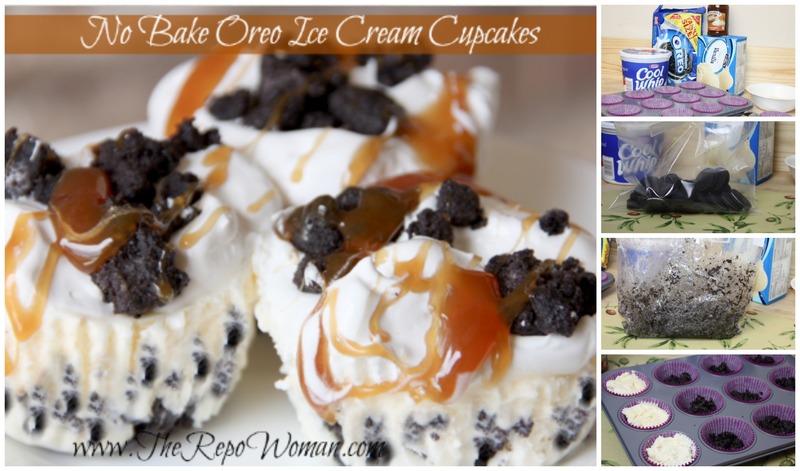 These are Oreo Ice Cream Cupcake delights! You are not going to believe how easy this one is! 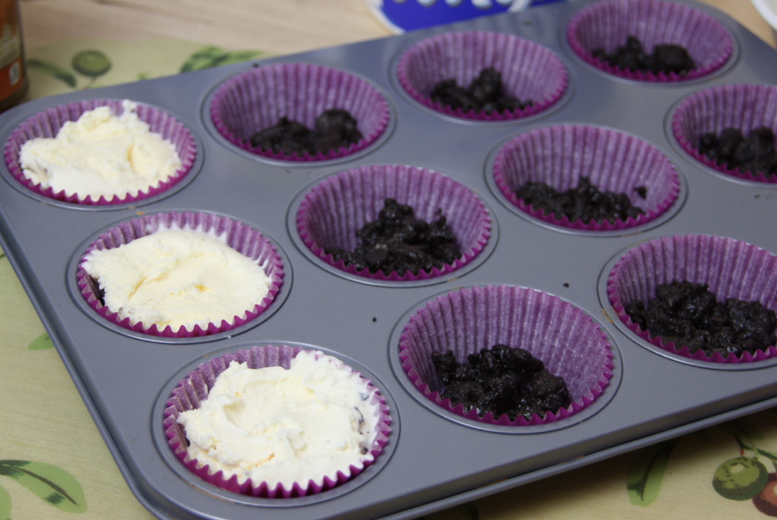 Start by lining a cupcake pan with cupcake liners. Then start crushing a bag of Oreo cookies. Oh the kids will love that part! Mine did! 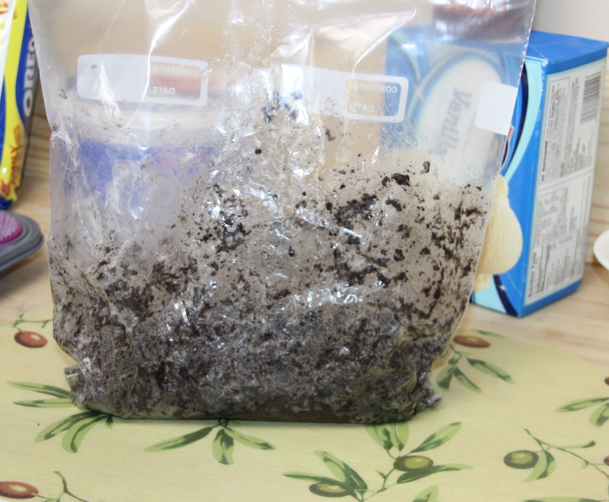 Next you add about 2 tablespoons of melted butter per cup of crushed Oreo cookies. 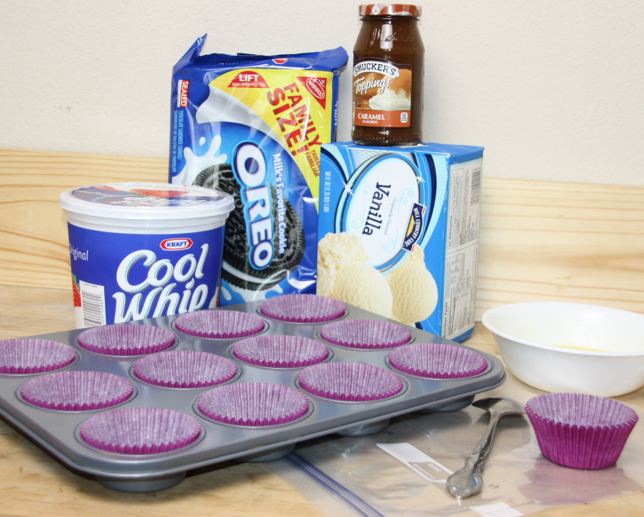 This get’s them nice and gooey so you can form them into the crust of the cupcake. Press the crushed Oreo cookies into the bottom of each cupcake liner. Note: The first time I did this I didn’t add enough Oreo Cookie mix to the bottom of the liner. This is the crust of your cupcake. Place a heaping tablespoon of Oreo Cookie mix in the bottom of the muffin tin but press the mix down with a cup that is just a tad small than the size of the muffin tin. This will help to push the crust up the sides and leave an opening in the bottom for your ice cream. Next add one small scoop of your favorite ice cream on top of the crushed Oreo cookies and flatten it. Then top it with a scoop of whipped cream. I always use the creamy Cool Whip brand because it tastes the best in my opinion. Be sure to stir it in the tub so it gets creamy enough to scoop out and plop on the cupcake. Freeze the filled cupcake pan for a few hours. When you are ready to enjoy them just pop them out of the freezer and drizzle it with your favorite topping (hot fudge, caramel etc…) and serve. 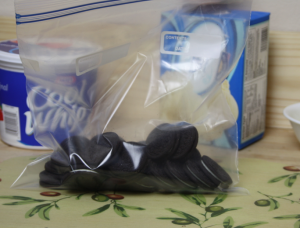 Be sure to let them set out at room temperature for about 5 minutes to soften up. 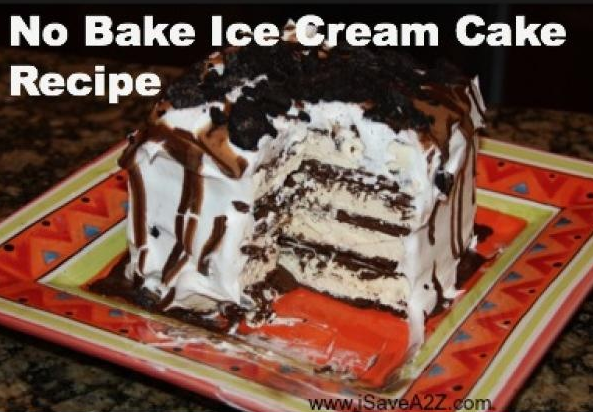 If you love this recipe, I know you will love our No Bake Ice Cream Cake recipe here too. Check it out! It’s a crowd pleaser at parties and always the center of the conversations!